In China, the vast personal healthcare opportunities are currently being stimulated by an increasing demand from a fast-aging population, rising income, and the tremendous growth of biomedical products and services in the domestic biomedical sector market. The growth of this additional demand for medical care and devices has increased in spending that is presenting a major boost to the biomedical sectors. Healthcare spending is expected to reach $600 billion by 2015 according to Medical Device Daily. This recent advancement in medical products has caused a blossoming of personal healthcare in China. 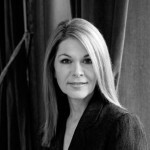 Healthcare reform seems to be a hot topic in the world today. The U.S. is not the only country undergoing a healthcare reform process. Many changes have been implemented that will drastically alter the healthcare landscape of China. For example, two years ago, the State Council in China allocated $125 billion to implement the New Medical Reform Plan to expand China’s services to improve universal health care for China’s population. Major components of the plan include efforts to expand medical infrastructure such as restructuring existing urban health centers and clinics and improving new ones. These implementations will help reform China’s healthcare system to become a source of innovation rather than a base for outsourced and dated biomedical technology. With these renovations, patients will be able to refocus their spending on disease prevention and health improvement. Because of the high demand for health screening within the middle class, one area of tremendous growth is the In Vitro Diagnostic (IVD) market. Hospitals have adopted advanced technologies in this area, causing more private laboratories to emerge. Another area of noticeable growth is in the Health Information Technology (HIT) sector which is expected to spend $4.1 billion by 2013. Moreover, patients will have a greater awareness of health and wellness, leading to increased demands for high-quality care. As for clinicians and hightech companies, there has been a surprising increase of interest in patient monitoring devices. For example, numerous domestic 24- hour ECG Holter Monitoring systems surprisingly mushroomed in China International Medical Equipment Fair last year to meet the escalating demands. The recent advancement for heatlhcare and medical devices has already provided a major lift to the biotechnology sector. China’s SFDA introduced nearly one hundred new industrial standards in December 2010, which will become integral parts of the medical device requirements beginning in mid-2012. Several special regions in China have already rewarded the desired environment for the development of biomedical products: Beijing Zhongguancun Life Science Park is an area dedicated to supporting new discoveries in advanced pharmaceuticals and medicines; Shanghai International Medical Zone specializes in device manufacturing, R&D, medical treatment and education; Taizhou Medical High-Tech Industrial Development Zone, with the support of the central government, focuses on scientific research in the manufacturing of medical equipment. 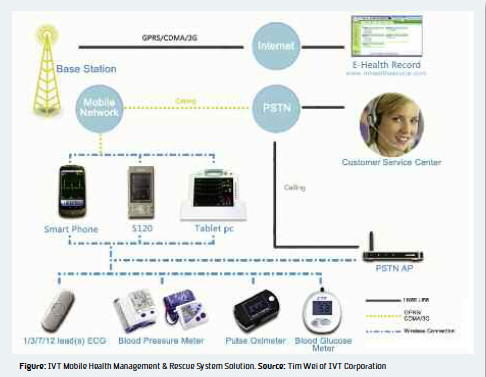 Among a mass influx of innovative medical products, the IVT Mobile Health Management and Rescue System has gained a lot of attention, and is a distinctly successful device. The system was chosen as one of the Top 10 Technologies at CES 2010. As a complete remote medical monitoring solution that allows medical monitoring from home, this device fully adopted most advanced Bluetooth technologies, reduces the risk of chronic diseases and assists with speedy rescues in the case of emergencies. Patients are able to measure blood pressure, cardiogram, and blood oxygen and glucose levels with the use of the mobile phone, wireless blood pressure meter, oximeter, glucose meter and other devices that come with the system. These signals are displayed on the phone, automatically tracked on the remote server, and sent to third parties through messages for convenient monitoring. As a foremost global supplier of Bluetooth software, Fixed-Mobile Convergence terminal solutions, and location-based marketing systems, IVT’s major product Bluetooth V4.0 High Speed has a user installed base over 100 million in 145 countries. The company applied its advanced Bluetooth technology, integrated various physiology measurement devices, and created a mobile health management and rescue system targeted to treat elderly people who suffer from chronic diseases such as cardiovascular diseases, hypertension and diabetes. The main device kit includes a S120 mobile phone, a wireless blood pressure meter, a wireless ECG monitor, a wireless oximeter, a wireless glucose meter and a wireless PSTN access point. The S120 is the first mobile phone that utilized Fixed-Mobile Convergence technologies. It can be used as a cordless phone to make it more convenient when making or receiving fixed line calls. Using this set of fully automated devices, a user can measure their blood pressure, review their cardiac activity, blood glucose level and blood oxygen level. The results, which stand for vital life signs, are displayed on the S120 and sent to the user’s Personal E-Health Record on a remote server where the data is saved and analyzed in real time. In addition, the companion mHealth software has also been ported to Windows Mobile, Android and Symbian platforms, so that users will be able use their own smart phones to monitor their health condition. The Personal E-Health Record is an online network platform of user health information; hospitals, emergency centers, or users can remotely access it. Emergency centers are able to use this record system to provide better rescue plans as all of a user’s information can be accessed based on an incoming caller ID from the S120 mobile phone. Similarly, hospitals can access their patients’ E-Health Record through this ID, giving doctors a better and more comprehensive understanding of their patients’ health history through the touch of a button. Finally, a national level call center provides 24- hour services with health consultants who can easily process any emergency rescue information and immediate assistance sent by the clients’ mobile device. In the case of emergencies, the patient can press a hotkey on the S120 to connect to the emergency center. A short rescue request with the location of the user is sent to all related parties including the IVT call center, emergency center, and relatives. These diverse devices and software systems offer just a small representation of the emerging technologies. Although there will be harsh competition and a whole different set of new rules and regulations to adhere to for the biomedical sector companies, China will have many novel and innovative technologies in personal healthcare products in the future, even surpassing the success of the IVT Mobile Health Management and Rescue System. New opportunities are continuing to grow with the planned budget allocations and implementation of specialized manufacturing and R&D research zones. With China’s already strong and established foundation in healthcare, the time is ripe for these technologies to fully blossom and come to fruition.